Posted by Richard Foote in Oracle OakTable. Just a short note to say the Oracle OakTable have launched a wonderful new website: http://www.oaktable.net/. Not only does it look great, but among its many features is a latest news section based on blog feeds from fellow OakTable members, new technical articles, clips and videos, latest twitter updates and is simply a great single location to find out what’s new and happening in the Oracle world. Well done to James Morle, Kurt Van Meerbeeck, Marco Gralike and everyone else involved on the revamped website. I would highly recommend paying it a regular visit and adding it to your list of useful Oracle bookmarks. 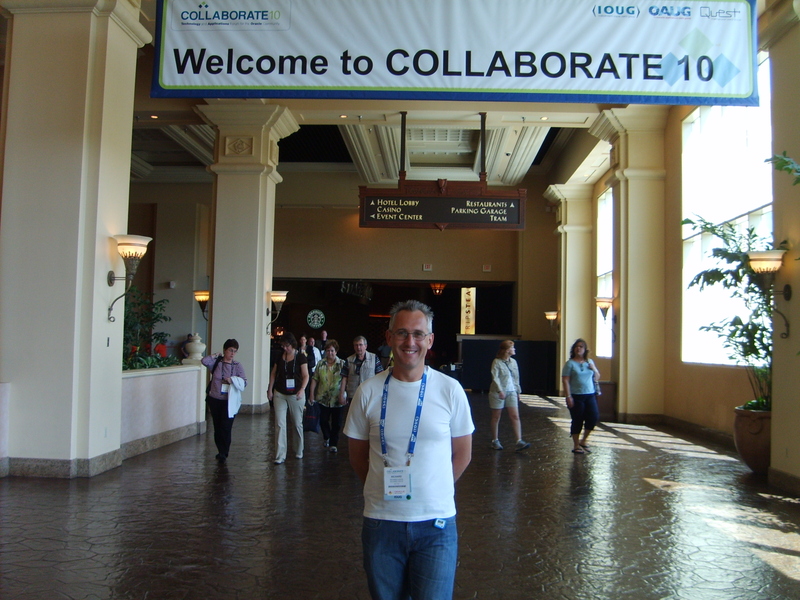 Posted by Richard Foote in Collaborate 2010, Richard's Musings. Just a short note to say I’ll be attending and presenting at next weeks Collaborate 2010 Conference in (hopefully) sunny Las Vegas. As with all good presentations, the room is filling up fast so make sure you book your seat early 🙂 Hopefully, I get the opportunity to meet some of you at the conference. Please stop and say hello. I’m really looking forward to spending some time again in Las Vegas, meeting up with some other Oracle ACEs and taking the opportunity to catch a few shows. Posted by Richard Foote in Bitmap Indexes, Non-Unique Indexes, Oracle Indexes, Oracle Myths. As I’ve discussed previously, using a Bitmap index on a unique column makes little sense as the underling index must be larger than a corresponding B-tree index due to the implicit additional overheads associated with Bitmap indexes. As such, Oracle doesn’t permit the use of a Bitmap Index on a declared unique column or to police a unique constraint. Therefore, some amount of index entry duplication is necessary for a Bitmap index to be considered. However, an interesting question is how much duplication is actually necessary ? At what point does a Bitmap index have the potential to be equivalent or better than a corresponding B-Tree index ? The answer will perhaps surprise many, especially those that only consider Bitmap Indexes to be viable for so-called “low cardinality”columns on large tables where there could be many millions of occurrences of each distinct value in a column. If one actually looks at what comprises an index entry in each type of index and understands somewhat how the bitmap column is comprised and effectively compressed, the rough ballpark answer becomes quite easy to determine. So that’s 10 bytes plus the size of the actual indexed column for a single column B-Tree index. The key point here however is that there’s an index entry for each and every not null index value. So the additional overheads comes down to the additional 6 byte rowid and the length of the bitmap column. The key point here though is that there may only need be one index entry (or Bitmap index “piece”) for each distinct indexed value. However, if the number of occurrences of each index value is very low (eg: say single figures), then it’s almost certain only one bitmap index entry (piece) would be necessary for each indexed value. The number of bytes required for the actual bitmap column depends on many factors, including the number of occurrences of each indexed value and the clustering of the data in the table. However again, if the number of occurrences of each index value is very low (eg: say single figures), it means the vast majority of bits are 0 (false) within each bitmap sequence and so can be compressed extremely efficiently. If there are only a handful of 1 (true) bits within a bitmap index entry, the bitmap column is going to be tiny and effectively compressed to only a few bytes. Therefore, the actual additional overheads for a bitmap index with few repeated values is only the 7 byte overhead for the additional rowid and its length and a few bytes for the actual bitmap column. But remember, this single bitmap index entry can cater for all occurrences of the indexed column, whereas the B-Tree index requires an index entry for each and every occurrence of the index column. = 24 bytes in total. but the overheads for the bitmap index only increases by a byte or so for the necessary increase in the bitmap column. So the difference in space between the two index types starts to widen significantly. Obviously, the size of the index column becomes a factor in the potential savings with a Bitmap index as it only has to potentially store the index column once whereas the (non-compressed) B-Tree index needs to store all occurrences of the index value. To illustrate the comparative differences between a B-Tree and a Bitmap Index, I’m going to create various tables with columns that have different levels of cardinality and different clustering attributes for their indexed columns and compare the size differences between B-Tree and Bitmap indexes. The indexed column will simply be a small NUMBER type column to make it just that bit harder for the Bitmap index to be the more efficient. In the first example, 1/3 of all values are unique while the remaining 2/3 of values have just 2 occurrences of each value. The column is certainly not unique but is arguably “approaching” uniqueness. Initially, the indexed column is very well clustered within the table (although with a bitmap index, the clustering factor in the index statistics is useless as it simply denotes the number of index entries within the index). Although some may claim such a Bitmap index, one with 666,667 distinct values in a 1 million row table would be thousands of times larger and less efficient than an equivalent B-Tree index, it’s actually quite a close call. The bitmap index is only 124 leaf blocks different or approximately 6.5% larger in size than the B-Tree index. We notice that the B-Tree index remains the same size but the Bitmap index is now a little larger by 117 additional leaf blocks. So even with an awful clustering, the Bitmap index is only 247 leaf blocks or approximately 12.3% larger than the B-Tree index. So the B-Tree just wins out in this case, the column is still just that bit too unique for the Bitmap index where we have 666,667 distinct values in a 1 million row table. OK, the Bitmap index is now larger by 178 leaf blocks than it was before, but the equivalent B-Tree index is still larger by 10.6%. Again, this is on a relatively small, extremely poorly clustered indexed column that has 500,000 distinct values in just a 1 million row table. The Bitmap index is smaller and more efficient than the equivalent B-Tree index. If we now use a column that has on average 4 occurrences for each distinct column value (with 250,000 distinct values in a 1 million row table), the differences between a Bitmap and a B-Tree index begin to widen significantly. Even with a really poor clustered index column, the B-Tree index is still some 74% larger than the Bitmap index with some 250,000 distinct values. Despite many claims to the contrary, including the rewrite of the awful Burleson article that started this series on Bitmap Indexes, where it still claims that “there are rare cases where a bitmap on a column with 10,000 key values might be appropriate” and “in most cases, there will not be a lot of adjacent index values, so it quite rare to see extensive compression“, in reality it’s not that rare at all for a column with “large” numbers of distinct values to be indexed effectively via a Bitmap Index. But, you actually need to understand Bitmap Indexes to appreciated this fact and have at least some understanding on how Oracle stores and compresses the bitmap column. The Burleson description of Bitmap index compression in the above article is totally wrong and so hence are its overall conclusions. Here’s an actual, “real life” example. On a 2.2 million row table with a column on people last names, (name columns are often considered way too distinct for Bitmap indexes), there were approximately 6.5 occurrences of each last name on average over the whole table. The most compact B-Tree index on the Last Name column required 5286 leaf blocks but the equivalent Bitmap index only required 2151 leaf blocks, way less than 1/2 the size, even though the clustering factor was terrible at nearly 2 million. As a rough rule, any column that has an on average of just 1 duplicate per distinct column value (just 2 occurrences per distinct value) is a potential candidate for a bitmap index. Bitmap indexes should only be considered in Data Warehouse, low concurrency DML type environments due to their locking implications and certainly pre 10g, Bitmap indexes had growth issues after significant DML changes. However it’s a complete nonsense to suggest that Bitmap indexes should only be considered with columns with “few” distinct values, else things will run 100s of times slower.